Formed in 1996, SALIVA broke out into the mainstream in 2001 when the band's angsty hard rock pummeling helped earn a double-platinum certification for their sophomore album, Every Six Seconds. Building upon their previously released track on the Dracula 2000 soundtrack and Every Six Seconds, Josey Scott brought more attention to the band with "Hero", a duet with NICKELBACK vocalist Chad Kroeger that appeared on the Spider-Man soundtrack and became an international hit in 2002. The band followed with seven more heavy-hitting albums released between 2002 and 2016 and a greatest hits collection in 2010. 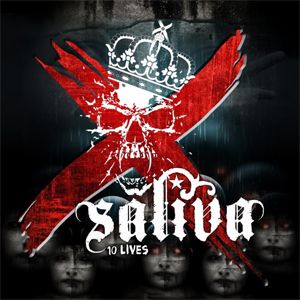 Featuring their trademark, no-holds-barred sound, SALIVA once again prove themselves as the champion hit-makers they are with 10 Lives - quite possibly the band's most energetic, catchy offering yet. Featuring 14 single-worthy anthems comprised of earworm hooks, shredding solos and razor-sharp production, 10 Lives will appeal to fans everywhere on the heavy music spectrum. Produced by frontman Bobby Amaru and Steve Perreira in Jacksonville, FL, 10 Lives is a labor of love that took nearly a year to make. The band says, "This is the tenth record for us - we call it 10 Lives. The title represents where we are at in the band's career. We feel stronger than ever... 10 Lives is about never giving up and grinding daily. We love making new records for the fans who continue to support the band through it all. This will not be the last!" SALIVA is currently on tour in the U.S. - visit the band's Facebook page to learn how to win a VIP Meet & Greet experience! See below for all currently confirmed tour dates.